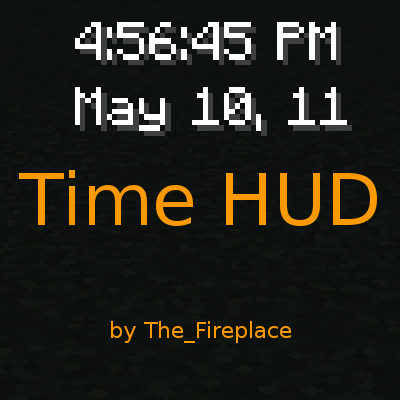 Time HUD adds the time and date to the Minecraft HUD. As of version 7.3.0, you can show both the in-game time and real life time, at the same time. This mod is client-side only, and works both in singleplayer worlds and when connected to servers. You can configure this mod using the Config GUI and the in-game GUIs(Check your controls to see how to open them). You can configure HUD locations(drag and drop, as of version 7.2.0), text colors(7.2.0 and later), sizes(7.2.0 and later), Time and Date formats, and whether it uses Minecraft time, Real time, both, or neither(disables the mod). Hi! I just found your mod and decided to add it to my current modpack. I look through the controls and the mod doesn't show up, but it shows up correctly in the corner so it is working. What's the default control? I would love to see the pc time and the minecraft time at the same time in the near future. I loved it! It's just what I needed! I love this mod. It would be even better if we could add custom calendars; nothing fancy, just a customizable list of "months" with name and length in days. I'd find it very useful because Minecraft's "year" is rather short if we consider how fast things grow and especially how the lunar month's duration is only 8 days. Good things to consider. I'll add it to my todo list. I'd love to see custom calendars too so I can use this with Tough As Nails Mod. If you add those features would would include them in the 1.10 version too? Could you please add realtime & ingametime together? I'll add it to my todo list. Done. As of version 7.3.0, you can view real time and in-game time at the same time. Hi,Producer!May I carry your Mod to the Minecraft forum in my area? Well,I come from China,and I will put this link on the thread.By the way,I like it very much. I 'm a student ,excuse me that my English isn't very good. As long as the only link to the download is a link to the Curse page, you can. any chance to get the display format to show more properly like a normal digital clock. Yeah, I'll work on it. For real time, fixed in Time HUD 7.1.0. Minecraft 1.11 only for the moment, but I plan to backport it all the way back to 1.7.10, and potentially as far back as 1.4.7 given Forge for that version is capable. For Minecraft time, was fixed in an earlier version. I have a smal lidea: add confurable option to show time only if player have clock item in inventory. What do you think about this? That's a good idea. I may do it. I've implemented your idea. I will even backport it to 1.8 and 1.7.10.